Mobile search apps (left to right): Bing, Google, and Yahoo. Desktop search? That's so last decade. Today, we've gone mobile--and so have search leaders Bing, Google, and Yahoo. In this active age, we're just as likely to turn to our smartphone to find what we want as we are to boot up our PC. And though many people consider Google the king of desktop search, things are not so clear-cut when it comes to mobile search, in part because delivering relevant blue links is only one aspect of a great mobile search experience. Mobile search is demanding. It's about navigating small screens; working with always-on, location-aware devices; handling speech input; and accomplishing a task. As users, we tend to have zero tolerance for irrelevant search results as we wait in line at Starbucks and search for movie show times. And when our phone finds a movie time, it had better deliver reviews, GPS coordinates to the closest theater, and an option to buy tickets. Mobile search is clearly on the rise. Google reports that more than 15 percent of queries its search engine receives come from mobile devices, and at Yahoo that number rises to 20 percent of global searches. Mobile search isn't something we use only while on the go, either: Many people use their mobile devices alongside or in place of their computers. According to a 2011 study by Performic, a marketing agency, 32 percent of people use mobile search more than computer-based search. So, how do Bing, Google, and Yahoo's Android mobile search apps fare against each other? In a highly unscientific comparison, we tested these leading mobile search apps to see which one would work best. To test the apps we created queries designed to mimic the way people use search on their smartphones--conducting general searches, requesting shopping searches, and trying to locate nearby places of interest. 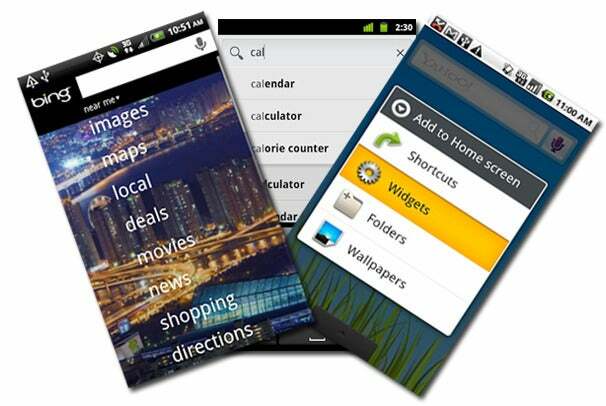 To get started, we downloaded three mobile search apps--Bing, Google Search, and Yahoo Search for Android--to our Android phone. Read on to see how they stack up. Bing's mobile search app shows a lot of attention to the attractiveness of its interface. Bing's appeal is obvious from the moment you launch the app: Its full-screen interface is gorgeous. The app highlights the same image of the day on the desktop version of Bing. 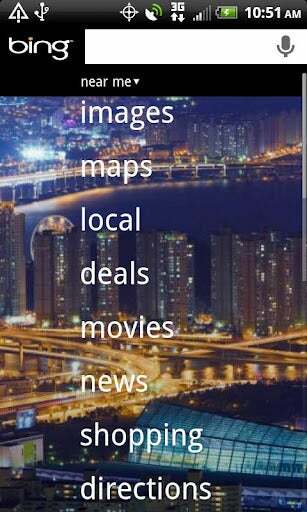 A list of search options runs down the screen, allowing you to choose from among images, videos, maps, local, deals, movies, news, shopping, and directions. Clicking on an option pulls up another attractive screen, which is prepopulated with info and links associated with the option that you might find interesting. The images screen, for example, displays thumbnails of images related to Bing's image of the day, while the videos screen shows links to Bing's video picks of the day. Every Bing screen includes a search query bar at the top. You can enter a query by typing it, or you can press the microphone icon and then enter the query by voice. Bing's voice recognition software worked flawlessly (as it did on the Google and Yahoo apps as well). Once you begin typing, Bing automatically pushes you to its search page, which displays suggestions as you type. This text-heavy page lacks the visual grace notes that Bing sports on its other pages. Your search results reflect the page from which you launched your search: If you start on the video page, you'll see video results; and so on. Searches launched from the home page return a general group of results, and you can switch between the various sections by means of a sliding bar that appears at the top of all pages. Overall Bing was most notable for delivering a slick, intuitive mobile search interface. Favorite interface: Bing. With its mix of beauty and intuitive navigation, Bing looks great and is easy to use, too. Google's mobile search app opts for interface simplicity but powerful search options. Google's mobile search app is as spartan as they come. Its interface consists primarily of a search query bar and a blue-and-white "G" logo. As you begin using the app, your search history will appear in the text fields below the query bar, which is useful if you tend to run the same searches repeatedly--especially if you need to do so while on the go. But don't experct to be wowed by the aesthetics. Fortunately, what Google's mobile search app lacks in looks, it makes up for in functionality. This excellent search tool integrates local results (what Google calls "Places"), images, news, videos, shopping, finance, apps, maps, books, and more. Rival Bing offers plenty of categories, too, but Google goes several steps farther, letting you search a host of Google services, including Docs, contacts, Blogger, iGoogle, Earth, Books, and Googles. The app pulls search results from multiple sections, depending on the content of your query; and if you don't like what you see, you can switch to another section--such as shopping, finance, or maps--by using Google's tabbed interface. The tabbed interface works well, but it can't match the fluidity and elegance of Bing's similar sliding bar. Most varied search sources: Google's ability to draw results from the Web, from your phone, and from various Google services makes this a complete search tool that can deliver comprehensive results. 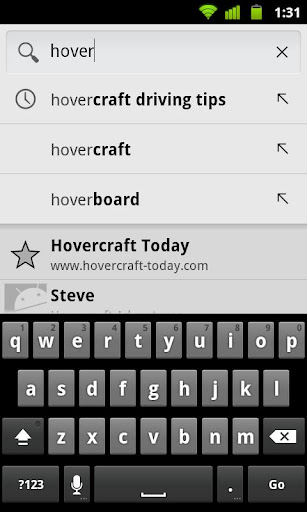 Yahoo's mobile search app lacks the elegance of Bing's and the power of Google's. Yahoo's mobile app is something of a mix between Bing's and Google's. Microsoft Bing powers Yahoo's search results, so it's no surprise that many of the results you see on the two apps are the same. But Yahoo offers nothing comparable to Bing's elegant design, instead featuring q Google-style businesslike interface, with a search query bar taking top billing. Rather than showing your search history, though, Yahoo's home page displays trending topics; you'll see your search history when you begin to type a query. Like Google's, Yahoo's results include a general mix of information, depending on the content of your query. You'll see Web links, local businesses (when appropriate), and images. The site also includes news results and displays embedded maps, as rivals Bing and Google do, but it pushes you to an external app when you need directions. On my Verizon-based Android phone Yahoo let me choose between Google Maps and VZ Navigator when seeking directions. 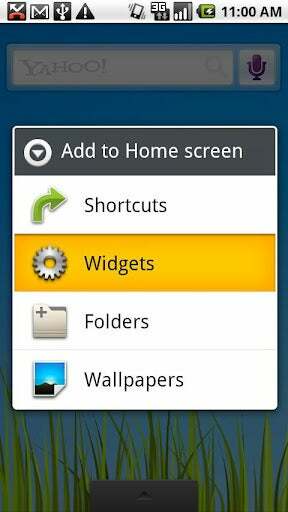 The app lets you set a default choice so that you won't have to make the choice each time you need directions. Bing succeeded in opening maps within the app, while Google Search pushed me right to Google Maps. Most room to improve: Yahoo's mobile search app pales in comparison to Bing's and Google's. It lacks the visual appear and fluid interface that Bing sports, and it can't compete with Google's varied sources of information.